The discoveries in this year's parallel fairs ranged from humorous to political. The Spring/Break Art Show, which takes place in the Post Office building on Eighth Avenue, is the more experimental, emerging curator-driven fair. Some of the rooms held very interesting shows and the hallways, which were dimly lit on the opening night, added to the mystery-on-the-hunt vibe. I was thrilled to see again the beautiful, labor-intensive crochet works of Caroline Wells Chandler in a solo exhibit presented by Lord Ludd. The transgender movement has gained very high-profile voices lately, but it seems that all the attention goes to man-to-woman transitions and not the other way around. Caroline, a Yale-trained, New York-based artist, isn't only transitioning from woman-to-man, but is also poignantly peeling layers of her own experience and capturing them in her work with humor and honesty. Another highlight of the Spring/Break was Tom Smith's solo exhibit curated by Rachel Barnard. The show was composed of a series of neon-colored digital media-inspired kinetic paintings hung in an immersive dark space. On another floor, Andrea McGinty's "Material Pressure" presented a selection whose best piece was definitely the cutout of a pageant queen by Colombian artist Juan Sebastian Pelaez: the beheaded glam curvy figure, which is part of Pelaez's "Acefalos" series, is both fun and tragic. The pain and pressure that comes with trying to become the winner or even a qualifying contestant in a beauty pageant, counterbalanced by how shallow and unimportant it is, reveals the tragicomic aspect in the work. At Volta, on Pier 90, two booths won my eyes and my heart: Tel Aviv’s Gordon Gallery presented a solo installation of Iran-born, LA-based Amir H Fallah. The compelling factor, besides Fallah’s strong combination of collage, acrylic and colored pencils on paper mounted on canvas, was the effectiveness of cloaked figures covered in beautiful patterned fabrics that protected the subjects’ identities while everything around them seemed colorful and optimistic. The fact that a Tel Aviv gallery chose to present an Iranian artist was a symbol that art is the only thing left that unifies all of us. The second booth that got me quite excited was that of Dutch Gallery Ten Haaf Projects with a solo presentation by Ukraine-born, Berlin-based Inna Levinson. Twenty-four small and small-to-medium pieces created using plasticine characters inserted in humorous scenes inside the frames of old windows portrayed narratives that verged between Italian Renaissance and the Grimm Brothers’ fairytales with some hilarious sexual innuendos. A total hit. Independent, which this year took place at Spring Studios in Tribeca, was the most beautiful fair in terms of the set-up. This fair looked more like a shoppable exhibition in a museum since there weren’t any booths, but each gallery had an expansive piece of a large floor, super high ceilings and enormous windows. I particularly liked the plywood and paper buildings meticulously painted and built by Pablo Bronstein, presented by London’s gallery Herald Street. Bronstein’s use of architecture as a means to engage with the power that stems from the decisions behind the building and financing of colossal structures throughout history also has an underlying romantic quality in the baroque and ornate details of his work. White Columns also had a great table filled with funky and unpretentious stoneware ceramics by Bruce Sherman that looked like creepy but lovable puppets. All these pieces together looked like a theatrical installation of eclectic characters, each competing for the strongest personality. 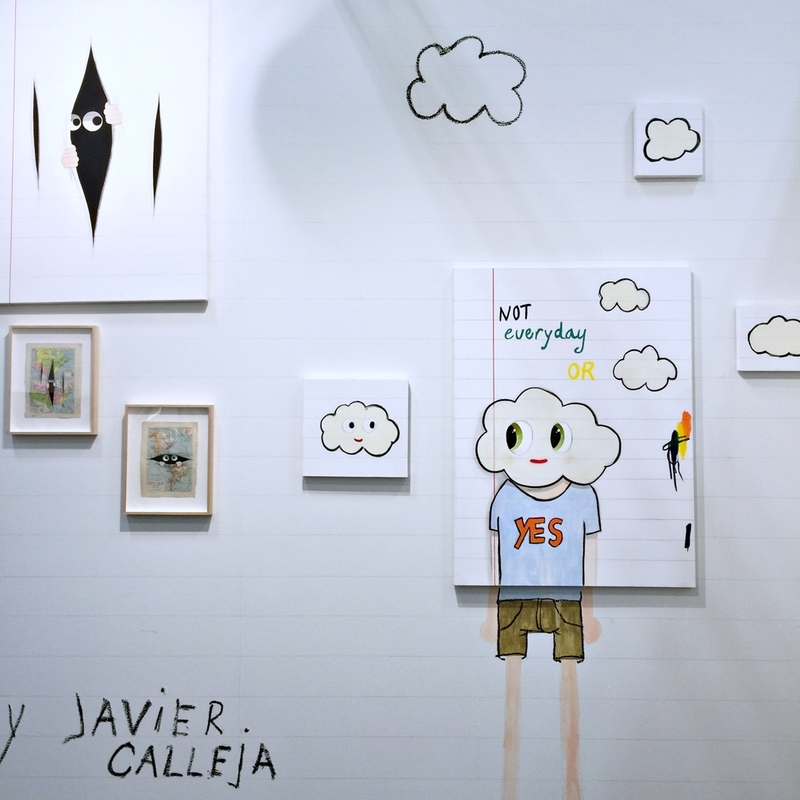 Finally, highlights of the Art on Paper fair, which was located on Pier 36 in Battery Park, included a lighthearted solo installation booth of Spanish artist Javier Calleja presented by Castor Gallery. Calleja, who was Yoshitomo Nara’s pupil, is the lighter, cheerful version of the more somber Japanese art-star. Making use of cartoon-based figures, including some based on Disney characters, the booth was humorously decked as if someone had stepped inside one of Calleja’s sketch notebooks. Asya Geisberg also presented a set of colorful, self-deprecating and labor-intensive drawings by Rebecca Morgan. The beauty of Morgan’s work lies in the fact that her self-portraits are fully embracive of who she truly is: weird, funny, and sometimes emotionally uncomfortable, making her work 100% relatable.